Having finished Yelen Semova a few days ago, I went straight into painting her sister, the young, talented chronomancer, Mirika. Like Yelen, I started by sawing Mirika off her integral base and gluing her onto a GW style base. I’m getting better at this technique and really liking the results. 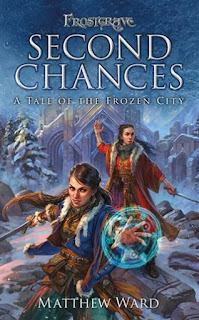 Also, like Yelen, I wanted to paint Mirika more-or-less as she appears on the cover of Second Chances. This immediately presented me with a problem. On the cover, Mirika is wearing a shirt that is decorated with lots of little flowers… my painting skills are definitely not up to free-handing a bunch of miniscule flowers. Instead, I gave the shirt a yellow-green base coat and then decorated it with little splotches of red and yellow, in the hopes that I could simulate the look. I always find it daunting to paint anything using this approach, such as camouflage, where you use irregular splotches of different colours semi-layered on top of one another. It tends to look terrible while you are painting it, like you’ve completely lost control of the brush, but hopefully, when the final colour is put on, it all sort of comes together. You can make your own mind-up how it worked here, but personally, I think it came out well, especially on the front, where there is less of her shirt visible. The back looks a little more polka-dot, but I still think it works well enough there. The rest of the model was more straight forward. It’s a very bright and colourful outfit (as befits the character). So, very happy with these little models. The sisters are ready to take on the dangers of Frostgrave! Occasionally, I finish painting a miniature, and I am so pleased with it, that I keep pulling it off the shelf to look at it like Bilbo having a quick glance at the One Ring. It doesn’t happen often, but it did with this latest figure. This is one of the few figures in the Frostgrave line that actually depicts a specific character. She is Yelen Semova, one of the two sisters that star in Matthew Ward’s novel, Frostgrave: Second Chances. I know I have said it before, but it is worth repeating, if you like adventure fantasy with strong characters, or you just really like Frostgrave, this novel is definitely worth a read. And, once you read it, you’ll almost certainly want to pick up the Semova sister miniatures! 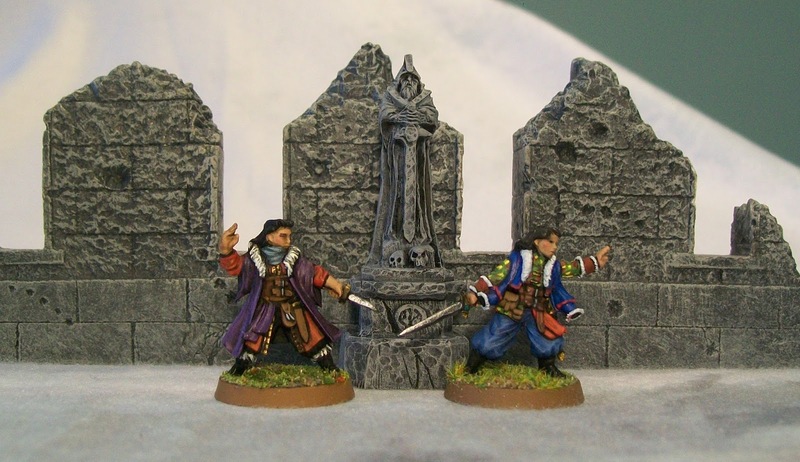 This miniatures was sculpted by Bobby Jackson to match Dmitry and Kate Burmak’s artwork that graces the novel’s cover. Bobby has done a wonderful job of deciding which details to include. I did my best to paint Yelen to match her look on the cover artwork (I’m generally pretty bad at choosing colour schemes anyway! ), and took as many attempts as necessary to get all of the little details I could manage. I hope the effort shows! Now, on to painting her sister! Last year, my cousin (twice-removed) David Walker passed away. As far as I can remember, I never actually met the man – maybe when I was very young – but we did trade correspondence on a couple of occasions. Both David and I were interested in the American Civil War, and specifically, our shared ancestor Maj. John Stewart Walker who fought for the Confederacy and was killed at the battle of Malvern Hill. A few months after his death, I saw my cousin (once-removed) Lucy, and shave gave me the little painting seen here. She said she took it from the wall of David Walker’s house after everything else had been removed. Likely, no one in the family wanted the responsibility of what to do with this obviously old, but slightly…(actually, I’m not sure of the word I’m looking for here) piece of history. Lucy said she felt bad that it had been abandoned, and knowing my interested in the Civil War she took it for me. For those who aren’t in the know about such things, the centre flag was the first official flag of the Confederacy. 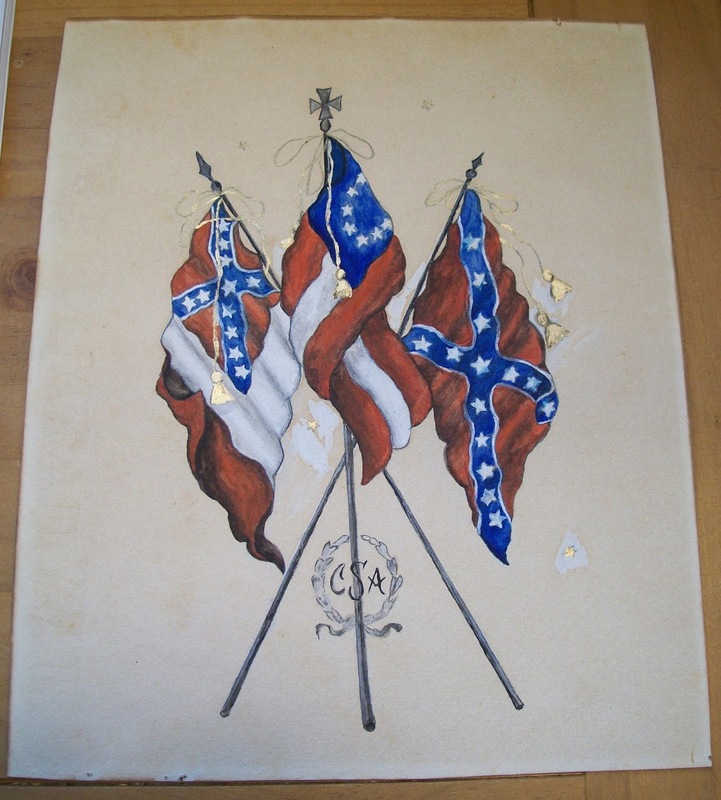 However, because of its similarities to the US Flag, it was soon replaced by the Confederate Battle Flag (the flag on the right) for military operations. 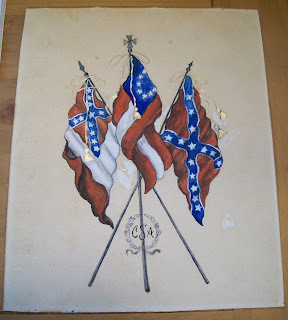 The flag on the left is the third and final ‘official flag of the Confederacy’, and was only used for a few months before the Confederacy’s collapse. While it’s nicely painted in most places, it has been somewhat crudely ‘cleaned’ with white paint in some spots. I feel safe in assuming this is the company that framed it. I suppose, if I was really interested, I could get a sense of when it was framed by figuring out when Richmond would have used 4 digit phone numbers, but I’m not sure what this would really tell me about the piece. Hoping to learn more, I took the painting out of its frame. Unfortunately, the frame was so old, it crumbled away during the process, and the endeavour proved mostly for naught. On the back of the painting, in pencil, are the numbers ‘9 x 11’ which is just the size of the piece, probably written by the framers, and one little line of illegible script in pencil, which may also be from the framers. I fear it will remain a mystery. At a guess, I would say the painting was done by one of the wives or children of one of the Stewart brothers (At least 3 of whom fought for the Confederacy). I think it is old enough to date back to the war. More to the point, the further one gets in time from the war, the less likely it seems that anyone would paint such a piece. So, now I am left with the question of what to do with it. I admit it, while I would feel no particular shame in hanging this on my wall (especially in a country where it would have little recognition or meaning) I feel no compulsion to do so. In fact, I’ve already got a photo of another of my Confederate ancestors on the wall – that’s probably enough for one war. For now, I think I shall just put it away in my filing cabinet. Perhaps to save for another generation to ponder over. I've been on a mini-painting tear lately. 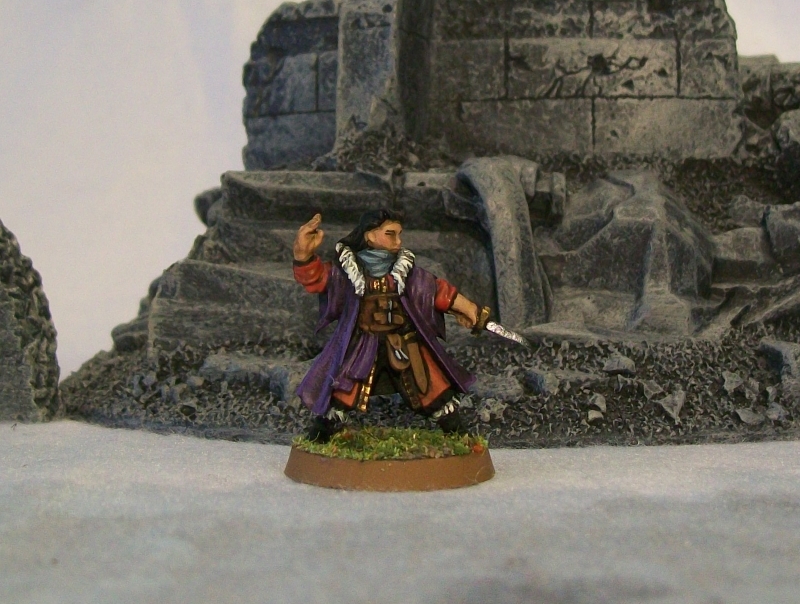 (That being a small tear of miniature painting). 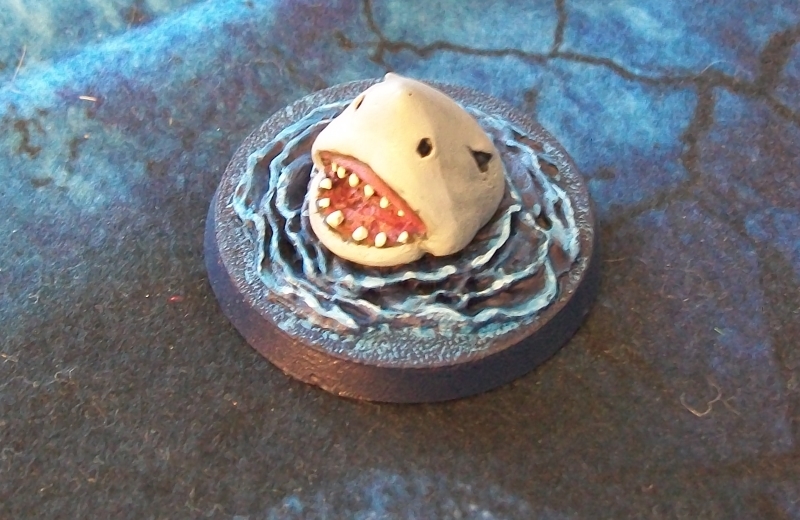 The latest miniature to fall before my brush is this Ghost Archipelago shark sculpted by Richard Kemp. I've got to admit, when I'm writing rules and making up monsters, I rarely stopped to think, 'how are they going to sculpt this'? I'm sure it has caused Osprey and North Star a few headaches! Which is all a way of saying that I think they did a great job designing a miniature for a shark that can actually be used on the table top. It is very simple, but hugely effective. It was also a quick, fun paint! The mini also comes with another little mini of a fin poking out of the water. I now regret not painting that up at the same time, but I'll get to it soon. 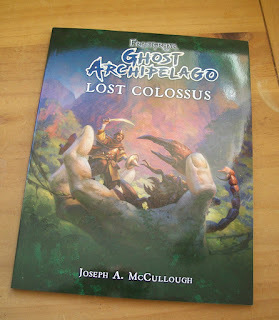 Now that I've got a shark, I might just have to have a go at that Ghost Archipelago scenario that Jim Kelly wrote for the latest issue of Wargames Illustrated! Here's a couple of servants of evil that I recently fished out of my lead pile. 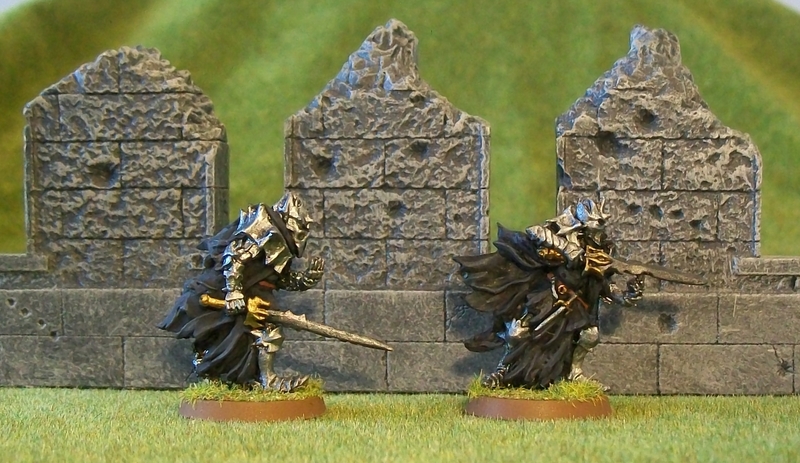 These guys were produced for The Lord of the Rings: Fall of the Necromancer supplement that came out many years ago. Basically, these guys are like budget Nazgul - just empty suits of armour, held together by Sauron's power. I love the models. I love the concept. I did not love painting them. Like painting Nazgul, these guys are just kind of dull when it comes to the brush. Silver and black with little detail to provide colour breaks. Still, I'm glad to have them done and in my collection as they really are cool figures. Now that The Hobbit movies have come out and given a new vision of Dol Guldur, complete with new Nazgul, I don't know if these guys have any place in the official game. Oh well, I liked The Fall of the Necromancer's take on Dol Guldur better than the one in the movie anyway. 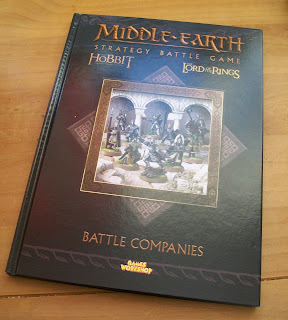 Long-time readers will be aware of my fondness for Games Workshop’s The Lord of the Rings, Strategy Battle Game, both as a game system and as a miniatures line. However, after a rebranding to The Hobbit SBG failed to catch the public interest, the whole line was allowed to languish, with both books and miniatures becoming increasingly out of stock. Then, with the recent resurgence of Games Workshop came a few glimmers of interest in the SBG. A few new figures appeared – as expensive Forge World resins, it’s true, but new figures none-the-less. Then, just before Christmas, GW released a new book, under a new branding – Middle Earth, Strategy Battle Game: Battle Companies. While the core of this book is drawn from a series of White Dwarf articles that appeared over a decade ago, the work, as a whole, is something brand new. And, in truth, I really like it. This book takes a new approach to the SBG, starting from a position of 'fun first, balance and tight rules second'. It will probably come as a surprise to no one who has played Frostgrave, that this is my default approach to gaming! In Battle Companies, you start with a small group of warriors, based around one of the core army lists, and over the course of numerous scenarios, you can grow your battle company in both skill and size. Okay, there is still very much an element of using the game to drive minis sales, but to some level this must be accepted and forgiven if we want the company to survive. What is really great about this book is the number and variety of basic scenarios (12! ), and, even better, the additional 5 scenarios that compose the narrative campaign. In these scenarios you can earn special rewards like having a wandering elf joining your battle company (or giant spider for you evil battle companies out there!). The only major drawback with this book is that you can’t actually play the game without at least 2 other books – some of which might be hard to obtain (Or, like me, you can plan to cheat and just use the out-of-date, but still wonderful, Big Blue Rulebook!). 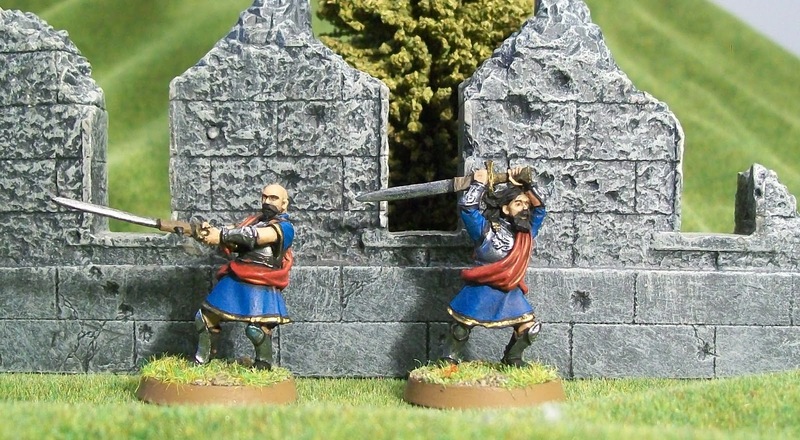 I was so pleased with the two warriors of Lamedon that I painted last week, I took the colour scheme I used for them and carried it straight into the next figure I painted. 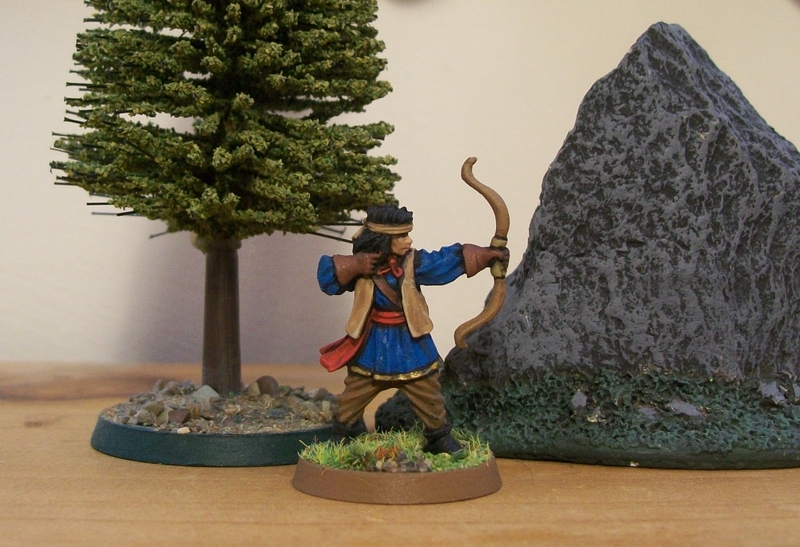 This archer is one of the ‘female crewmen’ that Bobby Jackson sculpted for Ghost Archipelago. I cut her off her integral base using a hobby saw. I was surprised how easy and effective this was, and I will certainly be using the technique for future figures. I really took my time painting her, because I was enjoying it so much. For me, this figure has the perfect level of detail – lots of distinct little areas, but nothing so small that I couldn’t see it or hit it with a brush. I’m not completely sold on the brown trousers. Perhaps I should have gone with a lighter colour there, but otherwise, I’m extremely pleased with the results. She’ll be joining my Ghost Archipelago crew, but, should Lamedon come under dire threat, she can always join in the defence! Did I mention how thrilled I am to have Bobby Jackson sculpting some figures for Frostgrave and Ghost Archipelago? Well, I am! So, what is Lost Colossus? Essentially, it is a big, ten-scenario campaign for Ghost Archipelago, similar in many ways to Thaw of the Lich Lord for Frostgrave. That said, I think Lost Colossus actually has a stronger narrative drive, aided by the fact that the scenarios are linked mechanically as well as through the narrative. 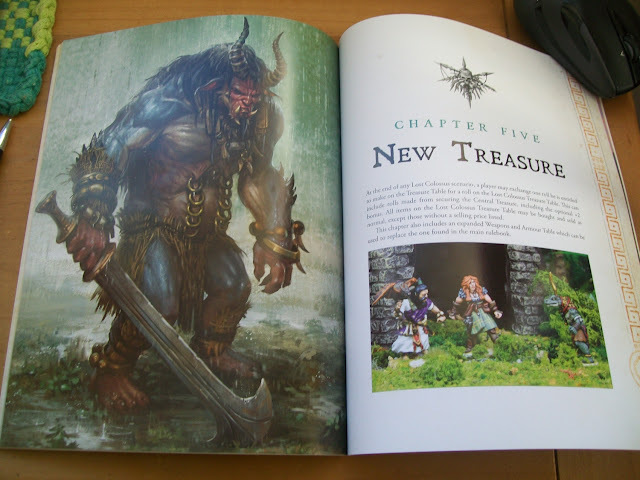 The book also includes a few new specialist crew members to hire as well as the obligatory new treasures and new monsters. Probably my favourite part of the new book is the short section on snake-men, which gives them their own brand of magic, including new spells. Anyway, I’m sure there will be more news about this in the next month or so, including new miniatures that will be available at the same time. Did someone say plastic snake-men? Earlier this week, I got frustrated with my painting. I had been pressuring myself to get some stuff done, and it was taking all of the fun out of it. So, instead, I threw 80% of my lead pile into a box and stuck the box at the top of my closet. Out of sight, out of mind, I hope. Of the remaining figures, I selected just two to put on top of my painting table - a pair of warriors of Lamedon from The Lord of the Rings range. I had painted the third figure in the pack nearly a year ago, but for some reason never got back round to these two. With only these two figures to focus on, I was astounded by how quickly (and how enjoyably) I blasted through them. I had one minor set-back, when I realized I was out of white paint, the colour I had been intending for their cloaks, but I just painted them red instead. Actually, I think the red looks better. The original guy with the white cloak can be an officer or chosen man or something. Having finished up these proud warriors, I have selected just three more figures to stare at me from the painting table. Hopefully, I will have just as much fun working on them. It is the time of year when everyone asks if you have any resolutions. In the past, I have been more into writing a list of goals (which I invariably fail to achieve) than in setting resolutions, but decided I would start this year with one. I am resolved to stop complaining. I don't know if I complain more than average, or if people consider me a complainer, but too often I hear myself letting out a little moan, and I've got three reasons it is time to stop. 1. I have nothing to complain about. Currently, I have a nice house, a healthy family, enough money that I don't have to worry about it day-to-day, professional success, etc. The more good that is in my life, the more any complaint I could make just sounds petty. 3. The older I get, the more convinced I am that we construct a large portion of our own reality with our thoughts and speech. Thus, the more I complain, the more real I make those complaints. Why would I want to do that? Better to talk about my great wife, great kids, great job, etc. I am sure I will fail at this resolution from time to time. Perhaps I will fail every day, but, I think as long as I keep it in mind, I will at least complain less, and that will be victory enough.